Former Star Trek star William Shatner has made a slew of Trek documentaries in recent years, so when I saw he had a new one about the first few years of Star Trek: The Next Generation, I wasn’t sure if it was worth watching. But it totally was. Shatner’s new film, Chaos on the Bridge, is a retelling of the origins and shaky early years of TNG. And that’s a topic that’s been covered a lot before, in books as well as copious DVD/Blu-ray featurettes. But Shatner has managed to get access to a ton of executives who were involved in the shaky early years of the Trek relaunch, including people like Jeffrey Katzenberg, and then-Paramount Network Television president John Pike. And they’ve been surprisingly candid with Captain Kirk. 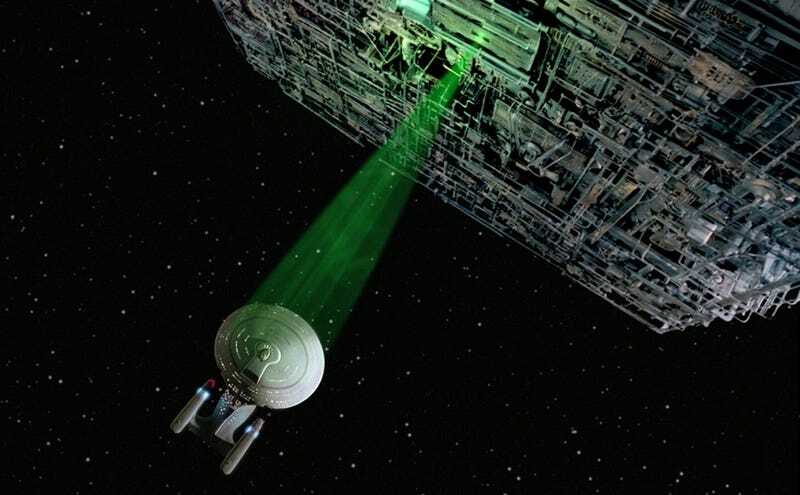 Basically, the main arc of Chaos on the Bridge is all about Gene Roddenberry’s involvement with TNG, and how Roddenberry’s input was mostly a net negative for the show. Roddenberry, of course, died in 1991 and isn’t here to defend himself—but pretty much everybody involved with creating TNG seems to agree that there were certain problems with Roddenberry, which nearly killed the whole thing on a few occasions. The picture that emerges is of a man who was angry and bitter after years in the wilderness following the cancellation of the original Star Trek in 1969. Roddenberry, according to all Shatner’s sources, had also developed a huge ego after years of going to conventions and college campuses and speaking to huge, adoring throngs—and the “Great Bird of the Galaxy” had started to believe his own hype regarding his status as a great visionary who pointed the way toward a utopian future for the human race. Meanwhile, Roddenberry was increasingly dependent on his attorney, Leonard Maizlish, who alienated both the studio execs and the creative people on the show. Maizlish was known for being an abrasive, difficult person, but also for attempting to control the creative direction of the show—writers would get scripts back with feedback that was ostensibly from Roddenberry, but was actually in Maizlish’s handwriting. Even after the writers lodged a complaint and got Maizlish banned from the Paramount lot, he still sneaked back in and tried to look through their computers when they were at lunch. In one memorable bit of the documentary, Pike tells Shatner that during negotiations with Paramount, Maizlish started “almost clutching his chest,” and Pike yelled, “I hope you die!” In another bit, writer David Gerrold recalls fantasizing about pushing Maizlish out the window. One of the surprising things in Chaos on the Bridge is the extent to which you find out that Roddenberry really didn’t even want to do a new Star Trek show. He’d resisted the idea for years, following the shelving of his Phase Two project in the 1970s. And it was only after Paramount started making serious plans to make a new Trek show without Roddenberry’s involvement that he freaked out and demanded to be involved. Roddenberry went into a meeting, and seemed startled afterwards to discover that he was actually signed up to produce a new Star Trek. At that point, in 1986, he’d been planning to retire officially in a couple of months. But Roddenberry immediately started to spar with the execs about the future of Trek. The execs wanted the captain of the new Enterprise to be a Captain Kirk clone (but Roddenberry himself absolutely did not want Patrick Stewart, either. Interestingly, Pike pushed for Yaphet Kotto to be the captain.) And Pike recounts a meeting where he insisted that TNG needed to have a two-hour pilot, but Roddenberry was adamant the pilot should be only one hour—leading to a confrontation where the show was nearly canceled before it started. And once Roddenberry was running Star Trek, he had firm ideas about how everything should run—and a lot of them were dictated by his new belief in his own status as a humanist visionary who saw the future of the human race as a kind of secular “heaven” where nobody ever had any conflict or disagreements of any kind. In one telling bit, Rick Berman (an exec who later became the show’s producer) says Roddenberry used to talk about being friends with L. Ron Hubbard—and Roddenberry would boast that he, too, could have started a religion if he’d wanted. To make matters worse, Maizlish and the showrunner that Maizlish hand-picked, Maurice Hurley, both pushed Roddenberry’s utopian vision further than even Roddenberry had wanted. Hurley recounts that by the middle of the second season, Hurley was fighting Roddenberry because Hurley had gone further with the “no conflict, everything is perfect” ethos than even Roddenberry felt comfortable with. A lot of the details about why the first two seasons of TNG were so horribly uneven will be familiar to anyone who’s watched the Blu-ray extras. But Shatner, who worked with Roddenberry for years, is pretty merciless in dissecting his former boss’ flaws. Shatner pulls together a portrait of a man who was losing his hold on the thing he had created—and whose utopian ideals had gotten too unwieldy to allow for good storytelling. Chaos on the Bridge is now available on digital platforms in the U.S. and U.K.